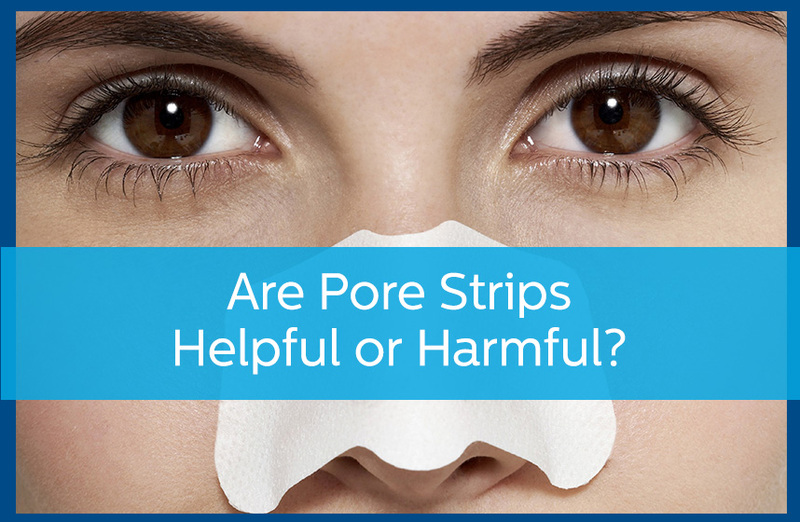 Are Pore Strips Helpful or Harmful? People often try various ways to get rid of blackheads, with one of the most common being pore strips. Pore strips are a regular staple in many women and men’s facial skin care routine. How Do Pore Strips Work? Pore strips contain a variety of ingredients, all of which are mixed with water to create a glue-like adhesive. As the pore strip hardens on your face, it attaches to your top layer of skin and peels it off when you remove the strip. Yes, pore strips remove dirt, oil, and dead skin cells lingering on the top layer of skin, temporarily improving the appearance of pores. What they don’t do is provide any permanent change in pore size or appearance. According to Brian Zelickson, MD, a dermatologist and director of Zel Skin Clinic, “Pore strips work by removing the superficial portion of the blackhead.” He also goes on to reveal pore strips rarely keep blackheads from recurring. Can Pore Strips Cause Damage? Pore strips are unlikely to cause any real damage. However, they may cause redness and skin irritation, especially for those with skin disorders like rosacea or psoriasis, or for patients using prescription acne medications. Craig Kraffert, a dermatologist and the founder of Amarte Skincare, says those with sensitive skin should avoid using pore strips. What Are the Alternatives to Pore Strips? Skin care products that clarify and exfoliate the skin can be a great alternative to pore strips. If you’re looking for long-term blackhead removal, try using a product that has salicylic acid or glycolic acid. These ingredients promote skin turnover and unclog pores. There are also several prescription and non-prescription retinoid medications that work by increasing cell turnover and preventing formation of new blackheads. It’s your skin. Make sure you’re being smart about your facial skin care routine. Follow these tips for healthier and happier skin and schedule an appointment with Avail Dermatology today to learn more about how to keep your skin happy. https://availdermatology.com/wp-content/uploads/2019/04/PoreStripsHarmful.jpg 560 858 Michelle Lee /wp-content/uploads/2017/08/logo.png Michelle Lee2019-04-16 19:38:292019-04-16 19:38:29Are Pore Strips Helpful or Harmful? Sandra Morris is excellent. I am so glad to have found her! She is kind, sensitive, and most of all — very professional! She's the reason I keep coming back! Dr. Dyer and his nurse were outstanding. I’ve never seen a more knowledgeable, patient doctor who took the time to answer my questions and explain all things skin related. I was beyond impressed with my whole visit. Thank you all so very much. It is never a pleasure to see a doctor about my health, however, the staff made the visit enjoyable — from the front office, to the nurse, and especially Dr. Dyer. Jennifer and Dr. Holzberg were excellent at answering my questions. I felt I received excellent care. Dr. Marcet was wonderful, as was my nurse, Allen. Such professionalism: from greeting me in the waiting room, to sending me home with care instruction and helping me schedule my next appointment. Avail Dermatology has been a respected provider of dermatological services since 1990. Formerly known as Newnan Dermatology, Avail has locations in Newnan, Peachtree City, and Carrollton. Avail Dermatology utilizes the latest advances in dermatological science and addresses common diseases to complex conditions. Avail's mission is to deliver superior treatment and offers patients a seamless continuum of services.